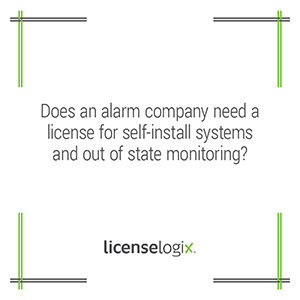 Alarm System Companies seeking to market, sell, and/ or monitor alarm systems located within another state may be required to obtain additional licenses, even if no physical installation occurs within the state. Business entity registration with the secretary of state may be required depending on the volume of business conducted in the new state or as a prerequisite for other licenses. Other states require tax registrations, local business licenses, and alarm system service licenses. For example, an alarm company that mails self-install alarm systems to residents of Illinois, Tennessee, and New Jersey, and performs security monitoring services from their home state, would be required to obtain additional licensing. Illinois specifically requires companies to register with the Secretary of State, Department of Revenue, and to seek licensing from the Illinois Department of Financial and Professional Regulation as a Private Alarm Contractor Agency. Similarly, Tennessee requires registration with the Secretary of State and licensing with the Alarm Systems Contractors’ Board. New Jersey mandates under the state’s Administrative Code Title 13, that alarm companies that monitor units located within the state hold licenses through the Department of Consumer Affairs as an Alarm and Locksmith Business. Other states, like New York do not require out of state companies to obtain licensing unless the business installs or services the actual units within the state. Companies that simply monitor the units are exempt from New York State’s licensing requisites. Let LicenseLogix identify all regulations and licensing requisites that apply to your business, and seamlessly navigate the filing process on your behalf. If you are already licensed, we can manage license renewals and ongoing license compliance. To get started, click here or call us today at 800-292-0909.